Another day in paradise filled with anomalies, paradox and mysteries starting with what appeared to be a pristine, yet inanimate, 2006 Audi A4 sadly waiting for attention. Bob drew the short straw – Bob always seems to draw the short straw when it comes to anything that might even remotely be considered an anomaly, paradox or mystery – and headed out to the Audi, scan tool in hand. He connected the scanner and was able to retrieve multiple Diagnostic Trouble Codes for a number of systems other than Engine Management, but was unable to communicate with the vehicle’s Engine Control Module. Bob’s roots go deep into the deep, rich soil of a South Dakota farm just off the Interstate about a hundred miles west of East Elbow, Nowhere. It was far enough away from anything to ensure that everyone who lived there had better know how to fix just about anything. Survival, especially survival during the long, cold winters, demanded nothing less. Those survival skills coupled with his ‘farmer’s’ intuition and common sense have earned him the nickname of MacGiver. 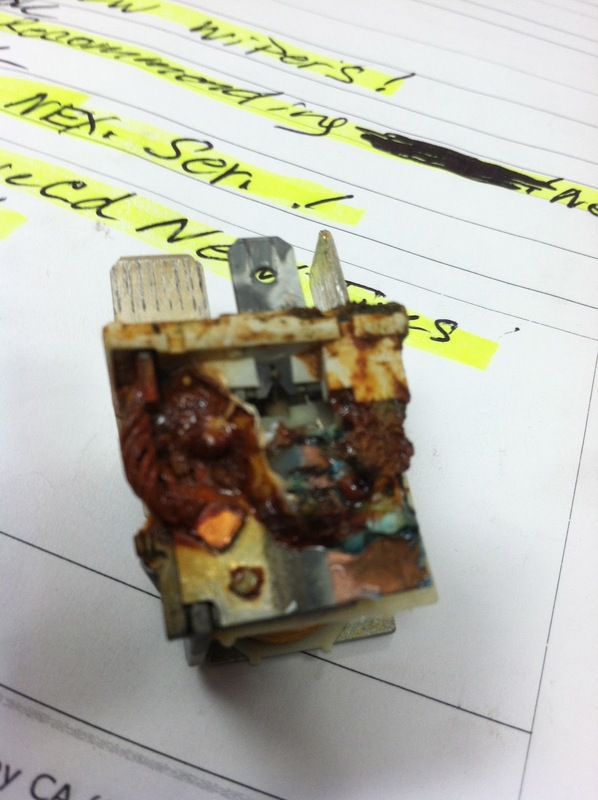 Something told Bob to go to the ECM first, even before checking for missing or blown fuses. I’m not sure about anyone else here, but one thing I’ve learned over the more than twenty years Bob and I have been “hanging out” is that attempting to distract him from his chosen path is futile. You have about as much chance of getting Bob to do or stopping doing what he feels he must do in order to figure out what is wrong with a vehicle as you would have of changing the weather or influencing the rotation of the Earth. The only problem was inspecting the ECM would mean removing the rubber strip that seals the plenum cover, the cover itself, removing the windshield wiper arms and then removing the screws that retain the ECM housing cover and then the cover itself. The first thing Bob noticed after he accessed the ECM cover was that the most inaccessible portion of the housing: the part that lives in the deepest recesses under the cowl was damaged, broken away and missing both the boss and bolt that goes through the top of the cover and the boss and retaining nut that fastens the top of the cover to the bottom. You could almost close your eyes and ‘see’ someone trying to remove the cover without removing the cowl and wiper arms by unscrewing the retaining screws you could see and then trying to either snake or muscle the cover off, not knowing there was another hidden screw. You could almost feel the plastic stretch and bend and then almost hear that sickening ‘snap’ as it finally gave up and gave out. There was only one problem with that cover being broken and that was the loss of integrity that occurred as its result: the housing was no longer watertight. In fact, the housing made a pretty good reservoir! A place to store water can be a good thing, especially if you’re traveling through the desert. However, it isn’t such a good thing if the receptacle is designed to house an electronic component such as the Electronic Control Module and its accompanying relays. As you can see for yourself, the result can be ugly! Bob cleaned out the housing, removed one of the relays – the one pictured here – and substituted a ‘known good’ relay in its place. 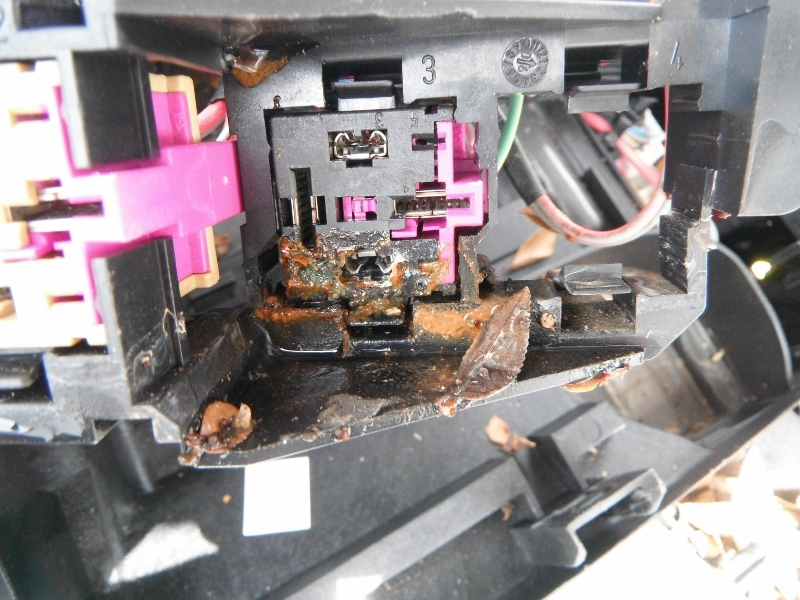 After recharging the battery and installing that ‘known good’ relay, the electric cooling fan no longer ran after the vehicle was powered down, but the vehicle still refused to start. Bob checked the fuses to find all the fuses good with the exception of the fuse for the cigarette lighter and replaced the two, twenty-amp fuses. Then he started looking for empty spaces: someplace that had the electrical contacts for a fuse, but no fuse in place. He found a slot for a fuse at the number forty-three position and I’ll bet you’ll never guess what that number forty-three fuse is for – Actually, I’m willing to bet that you have already guessed what it’s for: Engine Management! He installed the correct fuse and the vehicle started immediately: first try and every time thereafter. Done! Another vehicle saved from an otherwise ignominious, albeit watery death. I wonder if that makes Bob a Lifeguard as well as a farmer, Master Tech, L1 and Mac Gyver?